Hi everyone! Susan here today, with some of my "favorite-d" photos from Flickr. I LOOOOVE to sew and quilt, and often see my color choices from a recent quilt, mimicked in my scrapbook layouts and projects >> or vice-versa. 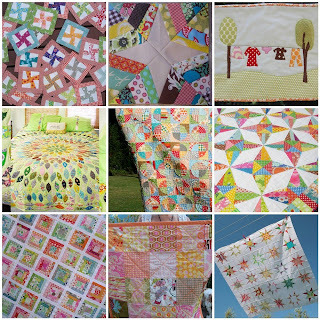 Flickr is a fabulous place to gather all types of quilting inspo! this may be dumb, but did you make these or find the pics online? these are all photos from the photo website Flickr - you can mark photos as favorites on Flickr - these are some of my favorites. ;) the links below the collage link back the creator/photographer of each. Those are just so happy.